SAVE MONEY! 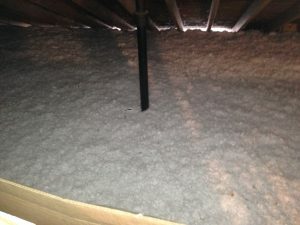 Upgrade your attic insulation and stop giving your hard earning money to the electric company today. If you own an older home you know how frustrating it is to pay high energy bills during the hot summer and the cold winter. You know the problems of fluctuating temperatures during day, and those hot spots throughout your home. During a recent remodeling project, our client mentioned that he was experiencing “hot spots” in his home, outrageous electric bills, and severe temperature fluctuations in his home – especially in the afternoon when the sun was beating down on his home. Mind you this is during the hot South Carolina summer. I asked to inspect the attic and sure enough I found very little insulation! R6 at best. Notice how you can see the ceiling joists. This attic is losing energy, and in need of attention. The most basic knowledge you need in regards to insulation is the R-Value. Simply enough the “R” in R-Value stands for “Resistance”. Essentially, the R-Value is a measurement of the insulation’s ability to resist the flow of heat. In your attic, the insulation provides a thermal barrier between your ceiling and the heat that accumulates in the attic. In your attic, you want a minimum of R38, which equates to 16″ of loose fill insulation (shown in photo). Loose fill fiberglass insulation is the most common material used in attics. Other materials you may find in your older home include cellulose and rock wool insulation, however upgrading to fiberglass is both cost effective and energy efficient. For our client, we provided a turnkey insulation R38 up-fit for his attic. Because we are general contractors, we work with the vendor(s) to provide the utmost value and service to our clients. We deal with all the scheduling, invoicing, quality control, and any potential headaches that come with dealing with vendors. Our client is now experiencing less expensive electric bills, and steady, cool temperatures throughout his home – at an excellent value. For our client, his investment will pay off in less than a year! He will be saving his money instead of sending it to his electric company. You can too! If you are experiencing energy loss problems (therefore money loss problems! ), please give us a call. 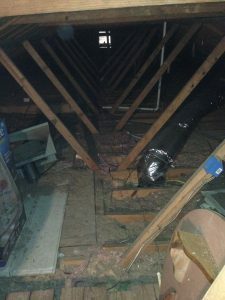 We will be glad to provide a home inspection to determine whether your attic is up to the latest standards and codes, and rectify the problem quickly, and efficiently so that you can start saving money! For more information about the other valuable services we offer to our clients please check us out here.